Rules allow you to move, flag, and respond to email messages automatically. You can also use rules to play sounds, move messages to folders, or display new item alerts. The easiest and most common rule to create is one that allows you to move an item from a certain sender or with certain words in the subject line to another folder. You can create this rule directly from a message you've already received. 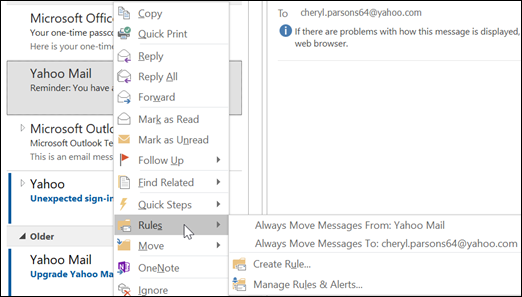 Right-click a message in your inbox or another email folder and select Rules. Select one of the options. Outlook automatically suggests creating a rule based on the sender and the recipients. To view more options, select Create Rule. In the Create Rule dialog box, select one or more of the first three checkboxes. In the Do the following section, if you want the rule to move a message to a folder, check the Move item to folder box, then select the folder from the Select Folder dialog that pops up, and then click OK.
Click OK to save your rule. Note: If you want to run the rule on messages you've already received, check the box on the confirmation dialog that pops up and then click OK. There are three types of rules you can create with the Rules Wizard. Stay organized: These rules help you filter, file, and follow-up with messages. Stay up to date: These rules notify you when you receive a message that fits a specific set of criteria. Custom rules: These are rules you create without a template. Rules are almost infinitely customizable. There are a variety of options you can set for each type of rule you create. Use the following steps to learn how to create a rule using the Rules Wizard. Select File > Manage Rules & Alerts to open the Rules and Alerts dialog box. On the Email Rules tab, select New Rule. Select one of the templates from Step 1. To start from a blank rule, select Apply rule on messages I receive or Apply rule on messages I send. In the Step 2: Edit the rule description box, click on any underlined options to set them. For example, if you selected Flag messages from someone for follow-up in Step 1, click people or public group to select which senders' messages you want to flag, then click follow up at this time to select a flag and a follow up date. On the second page of the Rules Wizard, you can add additional conditions to your rule. For example, you can select messages sent from a specific person that also have specific words in the subject or message body. In the Step 1: Select condition(s) box, any condition you set on the previous screen is checked. You can select multiple additional conditions by checking their checkboxes. In the Step 2: Edit the rule description box, click on any additional underlined conditions you just added. Then click Next. On the third page of the Rules Wizard, you can select additional actions to take on the message. For example, you can flag messages for follow up and mark a message as high importance. In the Step 1: Select condition(s) box, any action you set on the first screen is checked. You can select multiple additional actions by checking their checkboxes. In the Step 2: Edit the rule description box, click on any additional underlined actions you just added. Then click Next. On the fourth page of the Rules Wizard, you can add any exceptions to your rule. For example, you can check except if it is marked as importance to ensure that any messages marked with a specific importance level aren't flagged for follow up. In the Step 1: Select condition(s) box, select any exceptions to your rule by checking their checkboxes. In the Step 2: Edit the rule description box, click on any additional underlined exceptions you just added. Then click Next. On the last page of the Rules Wizard, enter a name for your rule. If you want to run this rule on messages you've already received, check Run this rule now on messages already in "Inbox." By default, Turn on this rule is checked. You can uncheck this box if you don't want the rule to be turned on at this time. Click Finish to save and turn on your rule. You can delete a rule when it's no longer necessary. On the File tab, choose Manage Rules & Alerts. In the Rules and Alerts dialog box, on the E-mail Rules tab, choose the rule you want to delete. You can manually run one or more rules. On the File tab, choose Manage Rules & Alerts, and on the E-mail Rules tab, choose Run Rules Now. In the Run Rules Now box, under Select rules to run, select the check box for each rule that you want to run. In the Run in Folder box, to select a different folder, choose Browse, choose the folder, and then choose OK. Select the Include subfolders check box to include all folders under the folder you chose in step 3. In the Apply rules to list, accept the default setting of all messages, or change to read or unread messages. There are two types of rules in Outlook—server-based and client-only. When you're using a Microsoft Exchange Server account, some rules are server-based. 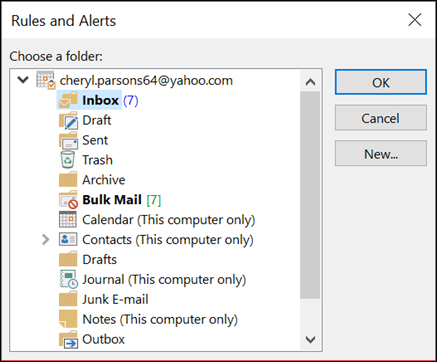 These rules run on your mailbox on the Exchange mail server even when Outlook isn’t running. Server-based rules must apply to messages when they are first delivered to your Inbox, and the rules must be able to run until they are completed on the server. For example, a rule that specifies that a message be printed can’t run until it is completed on the server. If a rule can’t be applied on the server, it is applied when you start Outlook and then becomes a client-only rule. Client-only rules are rules that run only on your computer. These are rules that run in Outlook instead of on the Exchange server. Client-only rules can only run when Outlook is running. Tip: If your list of rules contains both kinds of rules, the server-based rules are applied first, followed by the client-only rules. When rules are applied, delivery receipts, read receipts, voting responses, and Automatic Replies (Out of Office notifications) are processed as if they're messages. 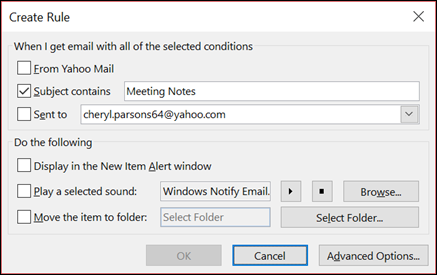 A rule that moves messages with the word "meeting" in the Subject box to a specific folder, for example, also moves all delivery receipts, voting responses, or an Automatic Replies to that same folder. Note: When a rule moves voting responses from the Inbox to another folder, vote tracking is affected. When a sent message that included a voting button is opened, the tracking information won’t include a tally for responses that a rule moved. Manually moving or deleting a response doesn’t affect tracking. If an item is moved to a folder other than a mail folder, the item might not work as expected after it's moved. For example, if a message is moved to the Calendar folder, a new appointment isn’t created. If a meeting or task response is moved to the Deleted Items folder by using a rule, the response isn’t tracked by the original item. If a meeting request is automatically moved to the Deleted Items folder, the meeting isn’t added to the Calendar. Rules that affect messages that you send aren’t applied to task requests and meeting requests. A rule that includes a Contact Group can behave differently than other rules depending on how the rule is created. This rule is available only if you're using an Exchange Server account. Only messages that are sent to the Contact Group are moved to the specified folder. Messages from people who are members of the Contact Group aren’t moved to the specified folder.